1. From what age can my child drink Parmalat Growth Milk 3+? If your child is 37 months or older, they can enjoy as much Parmalat Growth Milk 3+ as they like. If you child is given cow’s milk before the age of 12 months, the risk for constipation, diarrhoea, cramps and allergies increases. This is because their digestive systems are not fully developed yet. 2. How is Parmalat Growth Milk 3+ different from normal cow’s milk? 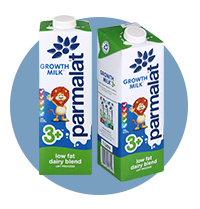 Parmalat Growth Milk 3+ has added vitamins and the minerals necessary for the optimal growth and development of children. With added iron, Parmalat Growth Milk 3+ is especially important for maintaining a strong immune system. 3. Has sugar been added to Parmalat Growth Milk 3+? A small amount of sugar is added to Parmalat Growth Milk 3+, but the sweetness of the product is mostly due to the UHT process and the vanilla flavouring. 4. What has been added to Parmalat Growth Milk 3+? Parmalat Growth Milk 3+ has the following added vitamins and minerals: Calcium, vitamin A, B1, B2, B3, B6, B9, C, D, E, iron and zinc. All of these are important for the mental and physical development of your children. For a great taste that kids love, we’ve also added delicious vanilla flavouring. 5. Where can I buy Parmalat Growth Milk 3+? At all leading retailers in South Africa. 6. Where do I find Parmalat Growth Milk 3+ in the store? These products are in the long-life milk aisle.